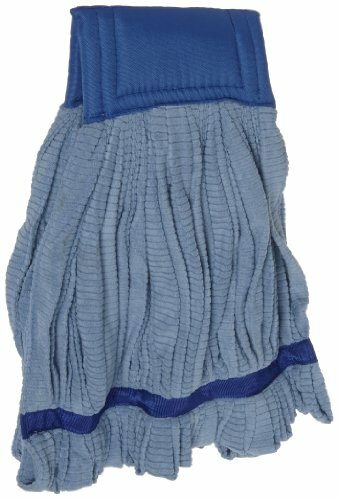 The Impact LF0021 microfiber tube wet mop is an extra-large wet mop head made of blue microfiber with a canvas headband and tailband and can be used with a clamp-style mop handle (sold separately) to mop floors. Microfiber absorbs liquids, resists shedding, and can be laundered. A textured finish allows the mop head to hold dirt until washed. A tailband provides wide floor coverage. The headband is made with canvas to resist wear. The color of the microfiber may be used to distinguish the wet mop from other mops for particular cleaning tasks. The mop head weighs 600 g.
Wet mops (also called string mops) consist of a mop head, a handle, and a method of attaching, or mounting, a mop head onto a handle. Mop heads are typically made of cotton, synthetic fibers, or blends of cotton and synthetic. Synthetic fibers withstand laundering better and dry faster, both factors leading to longer product lifespan because harmful bacteria grow in a damp mop. In traditional string mop construction, coarse strings of cotton yarn are banded at the head for connection to a handle, and the strings hang loose at the tail. This method is now referred to as "cut-end," to contrast with the improved method of looping the strings back to the head, leaving no loose ends to fray. Laundering is not recommended for cut-end mops. Other improvements include tailbanding, which ties the strings together close to the tail to reduce tangling and improve floor coverage. Mops are used for cleaning floors or for spreading an oil- or water-based floor finish onto a floor to protect the surface.